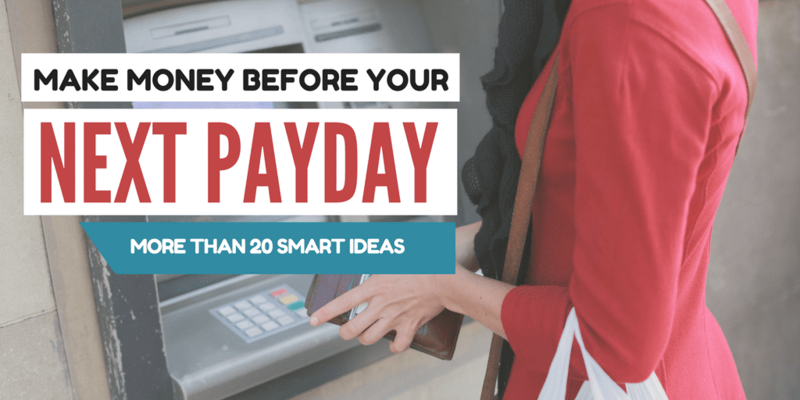 Are you in a cash crunch and need money before your next payday? Let's be honest, almost everyone has gone through a period where they needed money like never before. I did a little digging to find several ideas you can use to make extra money that may help you in a time of crisis. Please do share your own ideas in my comments! This post may contain affiliate links. I only recommend sites I use and trust. If you have an old model television or microwave that you no longer use, you can sell it and make money from it. These electronic items are quite popular especially if they are in good condition and can be sold very quickly on different sites or through a garage sale in your neighborhood. Online writing is probably one of the easiest ways to make money as there are many jobs available online for different types of pay. If you are an experienced writer and can deliver quality articles, you can earn good money from different sites such as Textbroker, Upwork, and Elance and that regularly hire writers. Items that you have not used for at least a year are considered to be old and should be gotten rid off to create space for others. If you are looking to replace the old stuff, you can sell them on eBay and earn fast money that you can use to buy new stuff for your home. You can also earn a little extra by scanning your grocery receipts with Ibotta. I just recently cashed out $150.00 sent within minutes to my Paypal account. See my payment proof below! Earning money with your car has been made possible by Uber and Lyft which allow individuals to convert their cars to taxis, so that they get paid when they pick up or drop off clients. You can work to earn a certain amount of money by setting your own schedule. Do you own a pet? If yes, ask your friends, family or neighbors that have pets to bring them over to your house when they are not around and you can pet sit for them at a fee. Most pet owners are usually willing to pay for such services as long as it is affordable through sites lie Rover and Dogvacay. Gaining knowledge through books is a hobby for many people leading to the purchase of books. If you are a book lover and have a stack of old books you have already read, consider selling them to Bookscouter and make profit from their sale. Many online users are looking for handmade items that are practical and unique to buy for their personal use or as gifts. If you are good with your hands and can create such items then selling them on a variety of online platforms for quick money will be easy for you. If you need to raise money for a cause you are passionate about then setting up a Go Fund Me account is the best way to do it. You only need to share your story as part of your campaign and in return attract support in form of monetary donations. Online users are always looking for solutions for different issues from experts .in various fields If you can offer expert advice on sites such as Operator and Cha Cha. 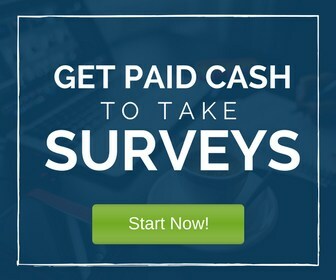 You will get paid for your participation if the customer is satisfied. Fashionable items in your closet can be a source of money quick money, if you know where to sell them. There are a number of sites such as Poshmark, where you can put them up for sale and earn good money within a short time period before payday. Unique items usually fetch a bit more money than those that can be easily found in stores. Companies pay to hear your opinions on various services and products that they have introduced in the market. They seek these opinions by allowing online users to review websites or even apps and give necessary feedback on the best ways to improve them or even get rid of them altogether. Music lovers can review music by upcoming artists on sites such as Slice the Pie and get paid. The pay is quite low, but if you can give online reviews on a regular basis, your income will increase to a substantial amount that you can use before payday. Photos are always in demand because of their regular use in web pages and other online publications. Therefore, if you take great photos and have some in your archive, bring them out and sell them at a profit on different online sites. Do you have an extra room in your house that is not being used? If yes, you can rent it out to college students looking for accommodation or allowing it to be converted into an office for a new or growing business. Airbnb is a recommended site to help renting out your spot easier. If you need to raise money urgently, consider pawning some valuable items from your home so as to get a quick loan. Some of the items that can be converted to cash by pawn shop owners include jewelry and exclusive craft objects among others. Applying for a payday loan on the basis of your salary is another way of raising money fast but I will be totally honest. Getting a payday loan can come with high interest rates and penalties, trust me, been there done that. If you have no other alternatives, try getting a getting a payday loan from a close family member or friend. Just be sure to payback! Babysitting can make you fast money, if you love spending time with kids. You can set a fair hourly rate and have many parents call you to take care of their kids when they have to run errands or just want a break from taking care of them on their own. Proper design work is always on demand and can fetch you good money if you always deliver high quality designs to your clients. Start by designing a number of graphics for low pay and then gradually build it up to earn well. Plan a garage sale event in your neighborhood and invite as many people as you can. Collect all your old and unused items that are in good condition and price them accordingly so that you can make a profit before your next payday. and get hits that will earn you money. The site offers hits that are of low value and high value thus giving you a chance to make money, if successful. In conclusion, making money online can be done without a hassle as long as you have an idea of where to start. If you continue to keep at it, you are likely to find yourself doing more than one leasing to increased income. Any Suggestions For Getting Money Before Your Next Payday? 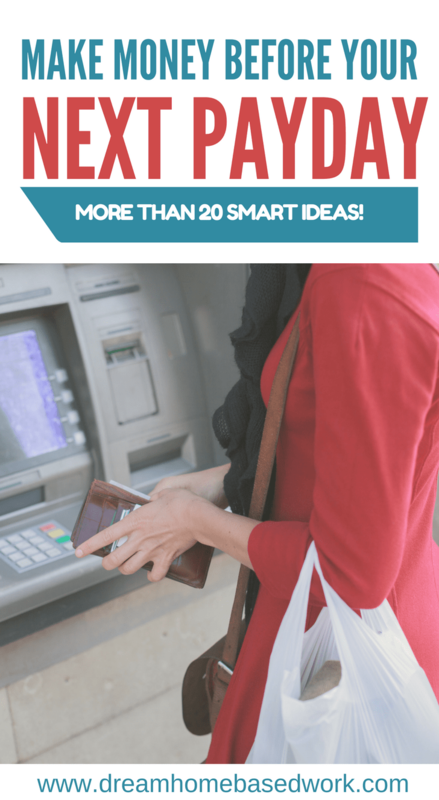 I have been reading your article and here you have provided a great list of ideas to make money. There are times when a person needs money like never before. And, this list will help to make money when needed without any more trouble. Thanks for sharing. Hi! Thanks for writing in. Were you looking for something more specific? any article writing job , which need no experience or portfolio . Here are a few sites that offer beginner writing jobs https://www.dreamhomebasedwork.com/beginner-freelance-writing/. Hi Lashay: Thank you for this information and for all of the work you do to provide with this information. I for one greatly appreciate it. I think all of your suggestions in this article are great except for # 17. Getting a “Payday” loan is not a good road to go down. The interest rates on those are sky high and if you have trouble paying it back it could lead to hole that is difficult if not impossible to get out of. I think people should steer clear of that option. That is just my opinion but, I needed to share it. The other suggestions are great and thank you again for all of the work you do.